Description: Spacious country living so close to town, located only half a mile from the new grc high school. 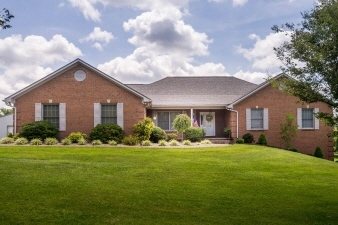 This 4 bedroom, 3.5 bath home sits on six acres of land and features over 3,700 square feet of renovated living space complete with a finished walkout lower level. The first floor master suite offers a large walk-in closet with built-in shelving and an updated master bath with oversized whirlpool tub and marble shower. Recently renovated eat-in kitchen includes granite countertops and stainless steel appliances. A large sunroom is conveniently located off the kitchen. Other features include an oversized family room with vaulted ceiling and a wood-burning fireplace. Two car attached garage with an oversized workshop and an additional 30x42ft kentucky steel truss building with concrete floor, electric and water is available for your farming needs. Data believed correct but not guaranteed. Buyer to verify data prior to offer. Agents read agent remarks.